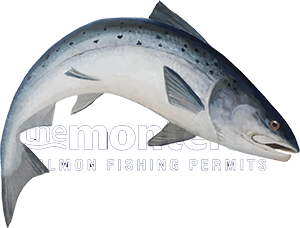 What's the point of going through the 'learning curve' of salmon fishing tactics and optimising your water coverage plus the expense of buying salmon fishing equipment if you're not going to maximise the opportunities to hook salmon as they arise. You'd be surprised just how many anglers fail in the very basic procedure of how to set a hook properly so here a few pointers that should set your mind thinking. Do you think that when a salmon takes and turns on a fly that a 'little green genie' appears from the hook with a big mallet and knocks the hook home for you or that all hooks these days have a 'built in' mini explosive charge that detonates to drive the hook home when it comes in contact with salmon mouth tissue! None of the above are obviously true however I can assure you that all hooks 'logically' require sufficient pressure to be set to ensure the fish stays on! Don't be fooled by a salmon 'take' or try to convince yourself that the 2 gentle taps you just received were only a trout which disappeared when you lifted the rod! Have the composure to do absolutely 'nothing' if any suspicious knocks on the line are felt as often the biggest salmon's take will start ever so subtly. So the 'mantra' for your head while salmon fishing is 'do nothing' and if you've a habit of reacting too quickly to a salmon then just repeat these words while you're fishing over and over and over again! If you can acquire the composure to let those initial tugs from a salmon develop into a lovely positive steady draw of line from your fly reel then you'll know the salmon has 100% turned and that only then is the time to react. The problem with a salmon take is and always has been 'adrenalin' which artificially speeds up your perception of time! When working as a ghillie on the Tay I noticed the 'take to landed salmon ratio' increased significantly after issuing all salmon fishing guests with a large Macallan on arrival in the morning! The best method I've personally found to put the 'brakes' on a salmon that's turned on the fly is by keeping the rod tip down and pointed in the general direction of the fish and clamping the fly reel face until the weight of the fish is felt for at least 2 or 3 seconds. That will set the hook properly every time regardless of whether the micro hold of the hook point was initially positioned in tough or softer tissue within the salmon's mouth as all that's between your hook point and your fly reel is the 'negligible' braid core stretch of your fly line and nothing else. If you follow the masses and the 'just lift into it' nonsense you'll more often than not be disappointed by the slack line that frequently follows! Logic should tell you that the softish 'lift' action of a salmon fly rod and a lightly set reel clutch is unlikely to ever give you adequate hook point pressure to set the hook properly! Take your time when a salmon takes your fly as when you've allowed that fish to turn you've already achieved a 'micro hook hold' somewhere in the salmon's mouth and the line drag from the flow of the river on your fly line will be keeping everything reasonably taught as the fish peels line off your reel. Visualising the river angle of the salmon at this point should tell you that the fish is now moving away from you (with forward momentum) so if you apply the 'brakes' with the rod parallel to the surface of the river and pointing towards the fish then there's only one thing that can occur and that is totally 'effective' hook point pressure which will set the hook properly in the salmon's mouth where it's never coming off!